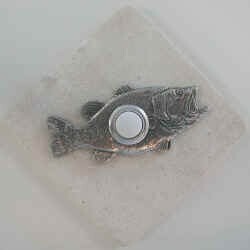 The Bass Doorbell comes with your choice of 4" square stone mounting plate and pewter Bass. Lighted push button and mounting adhesive for simple installation to any surface. Each stone piece is unique and will vary slightly in appearance. Sample shown is Light, Smooth Travertine.